Recently I attended a simple daily Mass along with 60 students in grades 6-12. Let’s see, that places them somewhere between the ages of 11 and 18. So given that there were only 70 people in the church – students and a handful of adults- I would say that the average age of the congregation was somewhere between 15 and 16. Sometimes people prepare for a big event through careful planning. We say to one another “this is going to be a special event and naturally everyone will want to see it.” Therefore we practice and we stage dress-rehearsals. We are careful to market the event and distribute flyers. Maybe we even sell tickets. But, strangely, we sometimes find ourselves in the middle of something big, something extraordinary…and surprisingly it is something that happened with absolutely no fanfare. We were not prepared for it because there was no advance marketing, no announcements, no flyers, no tickets-and consequently (and not surprisingly) no audience or crowd of witnesses. And this simple daily mass with these ‘children’ was just such an event. Somewhere during the Mass I found myself thinking: What is going on here? This is absolutely beautiful! I don’t think these kids are even aware of what they are accomplishing! And what was it that they were accomplishing? They were accomplishing, in an unassuming and unostentatious manner, the very thing that every Church Musician, every Liturgist, every Pastor, every Bishop…nay even the Fathers at the Second Vatican council wanted to accomplish when they wrote Sacrosanctum Concilium. Granted that active participation does not mean the same thing as actual participation, nonetheless these kids were demonstrating active participation to the greatest extent that I can imagine. Let me give you a quick overview of what happened. 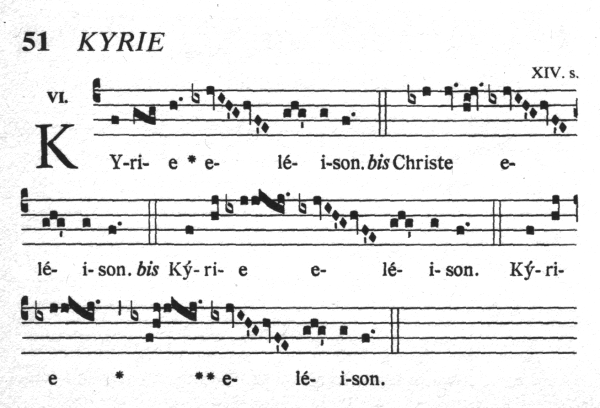 As it was a simple daily Mass, the students chanted the Kyrie (from the Gregorian setting Mass XVII). So singable, so lovely! What is it about Gregorian chant anyway? The words are melded so perfectly with the melody that the two become one… like body and soul. Have you ever heard a crowd of 60 youngsters singing Gregorian chant? And singing it beautifully and singing it from habit? They sang it gently while allowing for the natural rising and falling and swelling and diminishing to dispose the soul in the perfect attitude that the prayer itself calls for. I don’t know how the Holy Trinity could refuse when invoked by voices in such a way! And then they sang the Gloria! Now as a parish organist and music director, understand that, I am a paid professional. I take it as one of my primary duties to do my level best in coaxing the congregation at my church to sing the Gloria every Sunday at five different masses with hundreds of people in attendance. One day I dream of introducing the Gregorian Gloria VIII (aka Missa de Angelis) to our parish, but for the time being we are required to sing the recent Mass of Kevin Keil (The Mass of Saint Francis Cabrini). And a parish music director must be sensitive to the fact that singing music in Latin, Gregorian chant no less, might in fact excite a stampede in protest. How can anyone ever be expected to sing music in a language which one doesn’t speak or understand? But as far as I am concerned the Gloria from the Missa De Angelis is in fact a perfect Gloria. there really is no need to sing any other. It is easy. It is tuneful and memorable. The rhythm and melody match the words perfectly and the soul is aroused towards the worship of God! At the offertory they sang the lovely Marian hymn Ave Maris Stella. I have always loved this hymn to Mary the star of the sea. She is the one to whom we must always appeal as we sail through the storms in our lives (or should I say the storm of life?). This hymn has many beautiful verses and is therefore quickly and easily learned by just about anyone. For many of these students, especially the younger, the chant was new. For all of them it was never rehearsed. I suppose the older students knew it from having sung it at many previous school Masses, but the way the music is passed from the older students to the younger seems almost magical. The power of emulation! But that’s the way it is with those Gregorian Mass settings…you hear them once and can join in the second time. Even if you are just, say 11 or 12. That of course gives the full meaning of “bis orat qui cantat” (he prays twice who sings!). Now after the students received communion they sang the quintessentially appropriate communion chant Ave Verum Corpus. Mass ended with the the rousing Viadana Exultate Iusti. To hear their voices blossom forth into polyphony with the upbeat, fast-paced, exultant tones was a perfect conclusion as we prepared to step out into the rain of that bleak February morning. The priest processed out led by the altar boys. The final note of the Exultate Iusti reverberated throughout the church and then there was a profound silence. I looked around discretely from time to time to see if the kids were aware of what they had done. Yes- I know they knew what they had done, as far as youth knows…but were they really aware of the profound beauty that they had cooperated in producing? Were they fully aware of their cooperation in so sublime an act of worship? By the appearance of their youthful and carefree expressions I don’t think so. For them it was an ordinary experience – another school Mass. But in my hidden tears I knew it was nothing of the sort. This entry was posted in Music, Sacred Music, Sacrosanctum Consilium, The Mass, Uncategorized and tagged beauty, Classical Education, Missa de Angelis, viadana, worship. Bookmark the permalink. 18 Responses to The Secret to Beautiful Liturgy: Leave it to the Kids! 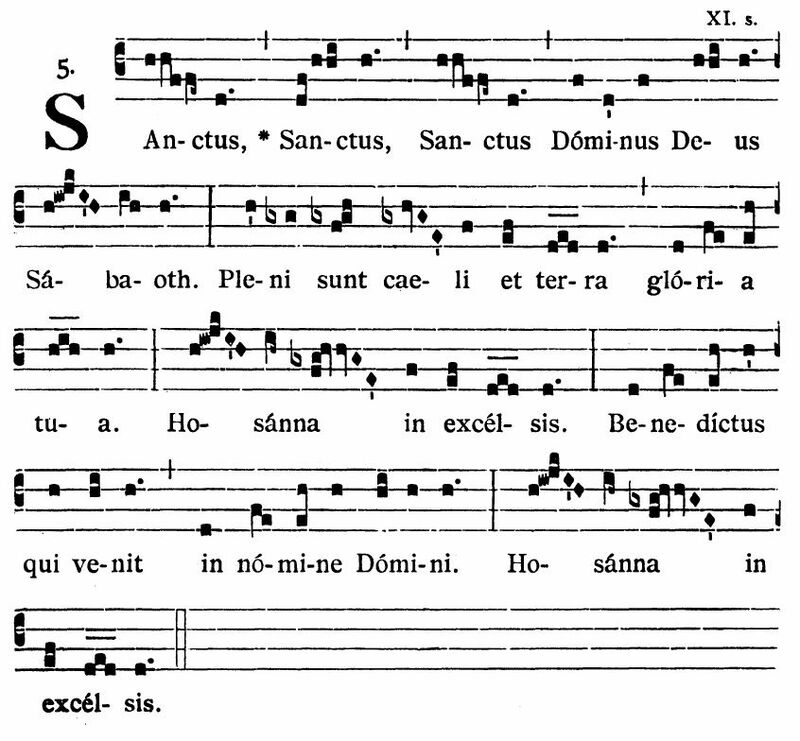 The Gloria from the Missa De Angelis is, in fact, my favorite piece of music. Perfectly lovely, joyful and worshipful, both noble and full of angelic lightness, in some mysterious way an evoker of charity and the virtue of religion! A beautiful and inspiring description of this “ordinary” experience for your students. Thanks, Mark! I know, this is so true. At the school where I teach, we often sing something like Jesu dulcis memoria, or Salve Regina, or Adoro te devote, after communion, and, before you know it, everybody knows how to sing it, and a chapel full of boys aged 8 to 18 singing Salve Regina (the fastest one for everybody to learn) is awesome. We were on a field trip a year ago and we had Mass in a field where we were camping, and at the end of Mass as the priest was going “out” of the sacred space I just started singing Salve Regina. Presto! unplanned singing of Salve Regina goes rolling through the hills from the lips of about 50 sophomores and teachers. Beautiful! Keep it up. Its wonderful how you can take those chants anywhere . Great. But as you know, quality liturgy is rare, whether “the kids” or others plan it. My local church has the highest quality liturgy all the time thank God. No kids involved. Wow, I would love to know where your church is. Our Lady of Clear Creek Abbey, Hulbert, Oklahoma! Ah! Well that explains everything. Sadly, most Catholic youth never get exposed to this timeless treasure. That’s a great idea. I love it! Although I think I am just about ready to throw caution to the wind and just start singing some communion propers. This is heartbreaking. Because you are showing us what could be done, but what is almost never done. Well, you know, Mark, just this morning we had a very similar experience of beautiful music sung by our children’s choir. This is thanks to your vision and energy for starting us off 15 (!) years ago. This morning, as always when the children sing, people – including the pastor- were filled with gratitude for the contribution those heavenly voices have made to the liturgy. Your legacy lives on, and we thank you! Thanks Molly… You are too kind! 🙂 I wish I could have been there to hear it. Where on earth do all those children keep coming from? I would love to get a younger children’s choir going out here. Our school kids sing a Gregorian High Mass nearly every school day at 11.20 AM EST, and you can listen to them live on SGGResources. We did the same in Catholic grade school in the 1950s, and it piqued my interest in studying and promoting good, traditional, Catholic church music. You just provided, inadvertently I think, an answer to a question that one hears all to often, about singing in a language one doesn’t understand. Whether or not we understand Latin, I bet we all understand the Gloria. Truly wonderful to hear! What a great witness to truth and beauty, and that kids can aspire to them. So many groups ‘ministering’ to the youth make the grave mistake that kids only can handle liturgy dumbed down with popular culture. Thank you!